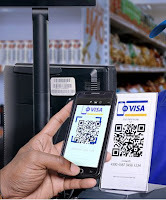 mVisa is a new mobile payment service by Visa in partnership with leading Kenyan banks. vVisa eliminates barriers like transaction costs, gives customers a convenient, secure and affordable experience. Increased sales opportunities - Receive payments from anyone, they don't need to operate banks accounts in the same bank as you do. Payment direct to your bank account - Get payments made straight into your bank account. You don't need to buy any expensive point-of-sales (POS) machines. Simple cash flow management - Get SMS notifications once a payment is credited to your account. Security, dependability and global acceptance - Enjoy the security and dependability of Visa’s global network and payments expertise. If you are interested in accepting mVisa, here's how. Register with your bank and link your bank account. Download the mVisa application on your smartphone. Display the mVisa signage at your business establishment together with the QR code.